Image: Jan Carson and Paul McVeigh pictured with Damian Smyth, Head of Literature and Drama at the Arts Council of Northern Ireland. Belfast-based writers Jan Carson and Paul McVeigh are representing Northern Ireland at the Jaipur Literature Festival. 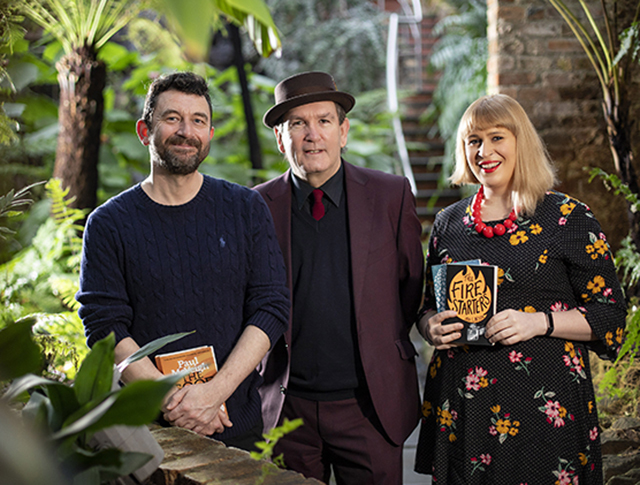 The writers have accepted invitations to read at the Festival with the support of the Arts Council of Northern Ireland and British Council Northern Ireland. Their stay in India will cover the five-day celebration at the end of this month. Considered one of the most important events of its kind across the globe, the festival brings together a diverse mix of the world’s greatest writers, thinkers, humanitarians, politicians, business leaders, sports people and entertainers on one stage to engage in thoughtful dialogue and debate. Other programme speakers this year will include Sebastian Barry, Germaine Greer, Anuradha Roy, Mary Beard, Alexander McCall Smith and Belfast Book Festival and Lifeboat Readings veteran Kayo Chingonyi. The invitation to attend the Jaipur Literature Festival is part of new links formed with key cultural institutions in India by the Arts Council as a platform for creating, sharing and promoting the creative arts. During the festival, Jan and Paul will take part in a number of panel discussions and debates, including one together entitled, 'What Is Not Said: Celebrating the Short Story'. Jan Carson is the author of the novel Malcolm Orange Disappears, a short story collection, Children’s Children, and a micro-fiction collection, Postcard Stories. Her novel The Fire Starters is forthcoming from Doubleday in April 2019. "I'm so grateful for the opportunity to visit a country I've always been fascinated by and to have a chance to showcase my own work alongside a host of Internationally renowned writers. I'm really looking forward to making contacts, encountering new writers and exploring Indian culture."